HOUSTON - Investors are finally taking record U.S. oil stockpiles seriously. 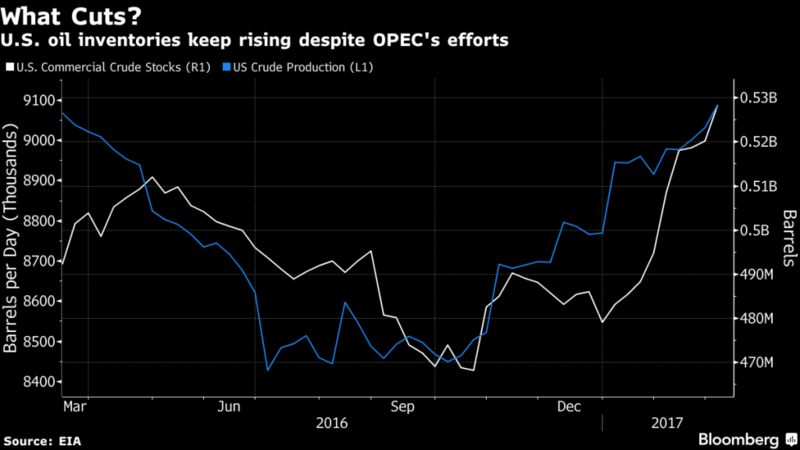 Oil slumped the most in more than a year after government data showed production cuts from OPEC and other exporters have not been enough to reduce U.S. supplies. Saudi Arabia’s Oil Minister Khalid Al-Falih said in Houston Tuesday that global supplies have been slower to decline than OPEC and its partners expected, leaving the door open for an extension of cuts that started in January. "The crude market is losing patience," Mike Wittner, head of commodities research at Societe Generale SA in New York, said by telephone. "The big rally in December after the OPEC agreement was based on expectations that the cuts would balance the market. While it looks like OPEC has cut more than 1 million barrels a day of output it’s difficult to see any impact on U.S. stockpiles." West Texas Intermediate for April delivery dropped $2.86, or 5.4 percent, to settle at $50.28 a barrel on the New York Mercantile Exchange, the lowest close since Dec. 7. It was the biggest decline since Feb. 9, 2016. Total volume traded was about 55 percent above the 100-day average. Brent for May settlement tumbled $2.81, or 5 percent, to $53.11 a barrel on the London-based ICE Futures Europe exchange, also the lowest close since Dec. 7. Saudi Arabia and Russia, the architects of the deal, presented a united front on complying with the cuts at the CERAWeek conference Tuesday in Houston. Alongside officials from Iraq and Mexico, they insisted the curbs are working. Managed money reduced its record wagers on price climbs in data released last week. They held almost 1 billion barrels of WTI and Brent crude futures and options at the peak, government and exchange data show. "There’s close to record speculative length and looks like it could be the start of the great exodus," John Kilduff, a partner at Again Capital LLC, a New York-based hedge fund that focuses on energy, said by telephone. "The comments at the conference weren’t reassuring to the market and the crude inventory builds are going to continue for a while given the low utilization rates." Supplies climbed 8.21 million barrels to the highest in weekly data going back to 1982 as production rose to the highest in a year. Wednesday’s market swoon has led to a return of volatility. The Chicago Board Options Exchange Crude Oil Volatility Index climbed to the highest level in two months after falling to the lowest since October 2014 on March 1. "As long as inventories do not drop the market will be volatile," Total SA Chief Executive Officer Patrick Pouyanne said Wednesday in Houston. Energy companies were the worst performers on the Standard & Poor’s 500 Index. The S&P Oil & Gas Exploration and Production Select Industry index fell 3.1 percent to the lowest level since November. Oil prices will tumble to $40 a barrel if OPEC doesn’t extend its pact later this year to cut output, according to Scott Sheffield, chairman of shale producer Pioneer Natural Resources Co.
Production from Libya’s Waha Oil Co., a venture between the state oil company and foreign partners, may be suspended Wednesday as clashes in the country’s eastern oil region keep the main export terminals out of service.